“It’s a world gone made” muttered the Saturday supermarket shopper, as he pushed his trolley passed the queue waiting patiently near the milk section of the New World supermarket. The queue had about 12 people in it when I walked by at 12.30pm. According to the staff member I talked to, the queue had been there since 9am. The public had been queuing for over four hours to get their hands on less than a litre of chocolate milk. “Are they queueing for samples?” asked my partner. 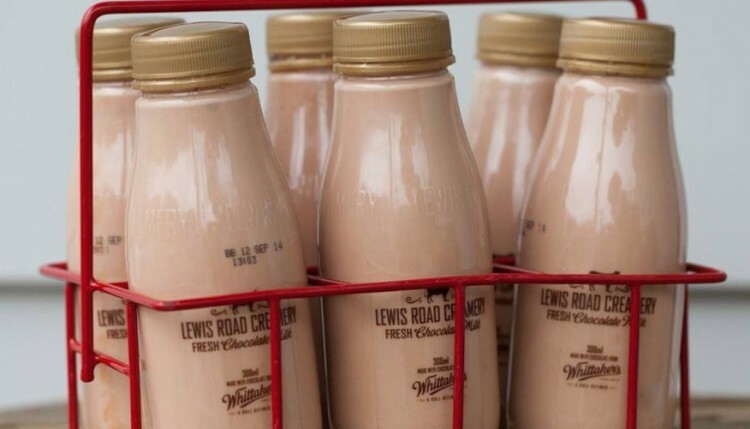 The launch of the new product, Lewis Road Creamery and Whittakers’s chocolate milk, has been an astonishing #success and a case study of the power of creating consumer demand. This is the kind of campaign that marketers think of when they tell their agency they want their new product/video/game to ‘go viral.’ They don’t really mean that they want (just) massive consumption of their content – a blog post, a video or a new online game, they mean they want the content to be so successful that consumers have to have the product that the content is promoting and the end result be that the consumers are beating down the door to get the product. As with all good campaigns, I was aware of the product without realising it. References to the soon-to-be-launched chocolate milk floated in my peripheral vision for weeks before its launch. 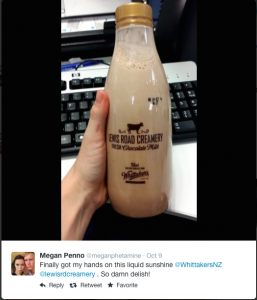 A Facebook friend who works for a New Zealand magazine posted about the free samples the magazine had been sent, raving and saying ‘it’s as good as they say it is.’ Similar to Pead PR and My Food bag, Lewis Road Creamery created early demand through passing samples to the ‘haves’ and making the ‘have nots’ wait. Whittaker’s own Facebook page posted about the upcoming ‘perfect marriage’ of good milk and good chocolate and ran competitions to give lucky winners free samples of the un-launched product. The move to co-brand with Lewis Road Creamery, and to produce a product which is not chocolate, is slight change in direction for Whittakers. L+P and Griffin’s Hundreds and Thousands biscuits are well-loved icons of kiwiana. They are reflective of mainstream kiwi life and remind many of us of our childhood. Lewis Road Creamery, producers of artisan milk and butter, are a relatively new company, launched in 2011. 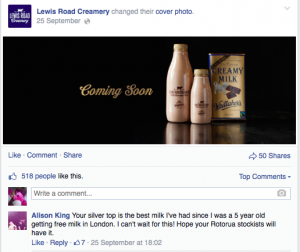 Lewis Road Creamery is a brand aimed at the premium end of the market. They charge a premium price for their butter and milk products, based on promising a premium product. I have watched the rise of Lewis Road Creamery with interest. I first saw them turn up at Farro and Nosh, high end supermarkets, and then I saw then turned up at some New World supermarkets and then…their milk turned up in my fridge. My partner is a fan of the milk. I like the product, but I like the brand more. Everything from the sleek design of the bottle to the font on the foil wrapping of the butter is an operation in building a premium price-point. First muesli went premium, or ‘artisan’, then it was yoghurt and now, with Lewis Road Creamery, our humble butter has got a little fancier. Yet in the launch of the chocolate milk mania, Lewis Road is reaching out to the mass audience. The chocolate milk has allowed Lewis Road Creamery to reach consumers who might only ever shop at New World Mt Roskill or New World Lower Hutt, and it is placing its brand in their hands, with the help of the known and trusted brand of Whittakers. Many of those who are queueing around the country will never have purchased (or probably noticed) Lewis Road Creamery products before now. I’m willing to believe that Lewis Road, Whittakers and their agency, Assignment Group, didn’t know just how successful the new chocolate milk would be. But the success of this product is not by chance. 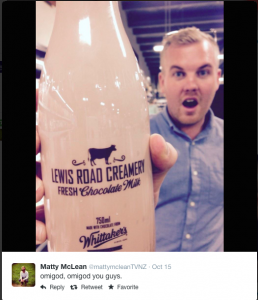 Unlike what one tweeter suggests, that ‘Lewis Road Creamery accidentally created the most sought after’ drink in New Zealand, there was no ‘accidentally’ in this campaign’s success. Why? Because former Group Chief Operating Officers of Saatchi and Saatchi don’t do accidental campaign success; they do success. Period. Peter Cullinane is the founder of Lewis Road Creamery and he is the former Group COO of Saatchi and Saatchi Worldwide, based out of New York. He is currently the Director of APN News and Media. But pedigree aside, the chocolate milk campaign has been a digital success. To my knowledge, no print, radio nor television advertising has been run to prompt this new product. This is a campaign entirely run through digital platforms. It has largely been round through social media and through the right product placement to the right tweeters or Facebook members, at the right time. When people are queuing on their saturday to get their hands on your products, someone on the strategy and planning side of the agency’s office has done a good day’s work. Hype and public awareness – golden words to marketers’ ears.